Most kids look up to their parents and want to do everything that they see them taking part in, but what is the one thing that your kids see you doing that they can’t do? Drive a car. One way to overcome this issue is to purchase the best Power Wheels so your kid will have a nice ride to drive around the backyard and down the sidewalk. You can buy them a truck, a jeep, or a sports car if you like, or you can choose from one of the many themed cars that are available. We have come up with a list of some of the top power wheel options available as well as a budget-friendly pick that your kids will adore. Once you are informed on which options will be a good choice, then it’s time to go shopping for your child’s very first set of wheels. 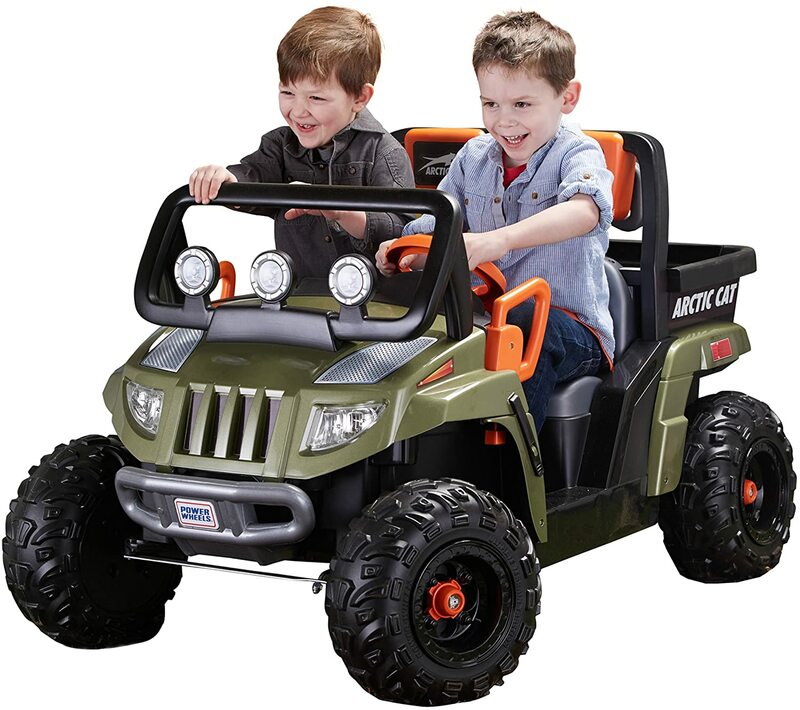 Fisher Price has been a leading manufacturer of toddler toys since 1930, so it is no surprise that their Power Wheels Jeep Wrangler comes in as our first pick. The trusted name has once again manufactured a durable vehicle that will give toddlers who are between the ages of three and six hours of fun. This Power Wheels is designed to look like a full sized Jeep Wrangler. Externally, you will notice that the vehicle is gorgeous; complete with features like rearview mirrors, headlights, tail lights, fog lights, and even windshield wipers. 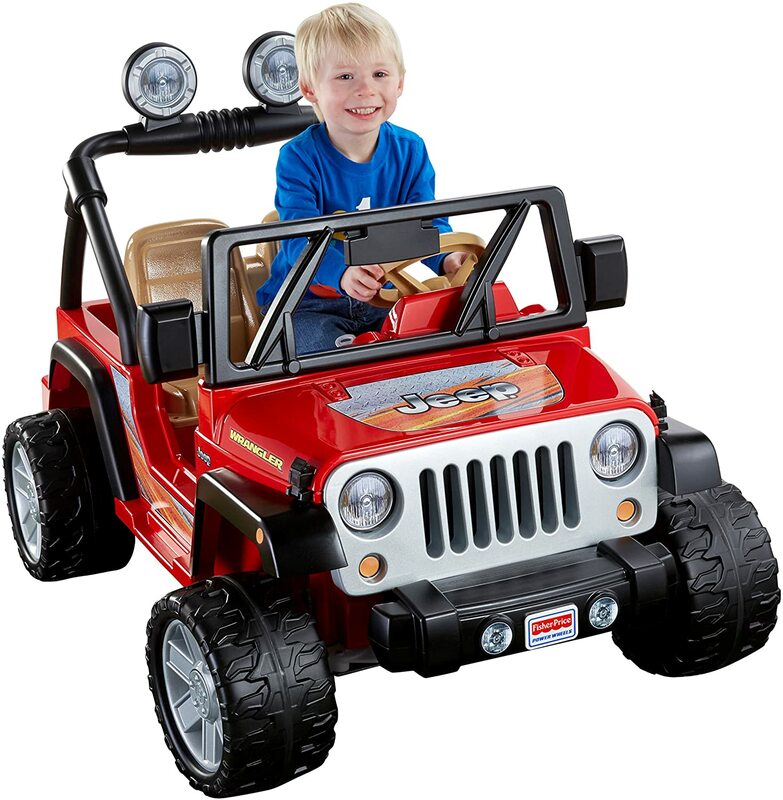 There are also features like the classic Jeep roll cage, grille, and fenders that are included with this Power Wheels. The vehicle is designed to accommodate two toddlers. In addition, there is a rear storage area to haul things across the yard. It is recommended not to load the vehicle down with more than 130 pounds at one time. 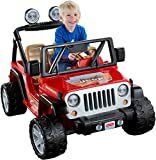 It is colored in a realistic lava red and black coloring that you see might see on a Jeep Wrangler, but this Power Wheels is also available in other color variations and themes. Some of the other options you can purchase are: A Black and Grey styled Jeep Wrangler, A green or black and green Teenage Mutant Ninja Turtles themed vehicle, two different shades of pink Barbie themed options, pink and purple Dora themed vehicles, baby blue and purple Frozen options, and even a blue Hot Wheels themed variation. Each variation uses coloration and decals to give it a unique aesthetic look. All in all there are about 10 different styles to choose from if you don’t think your child would like the design of a realistic Jeep Wrangler. The tires of this Power Wheels are designed to be thick and rugged, which means that they will be great for even pavement and flat surfaces, but they will really excel when put to the test in an off road situation. It will perform great in mud, grass, and in any hilly backyard. It will never struggle to have the power to ascend a small hill, and it is the perfect vehicle to use in an off road race. This vehicle is powered by a 12 volt battery, which means that it is one of the more powerful driving options available to toddlers. It also comes with a charging wire that hooks up to the battery when the charge is low. When you are driving, you can choose between two different speeds, which are 2.5 miles per hour and five miles per hour. There is also a reverse mode that allows your youngster to back out of traffic jams. When the vehicle is placed in reverse it can only go at a low speed, which is 2.5 miles per hour. Insofar as safety, if you find that your child is unreasonably reckless, then you may wish to utilize the high speed lockout option that allows parents to set the vehicle to only travel at low speeds. This can help a beginner learn how to steer better and decrease their chances of driving into a tree or toppling over as they race down a hill. There is also a power lock brake system that can help your child stop quickly. This is a nice feature to have when there are multiple children running around in the yard. It will help to ensure that the child driving will be able to stop before running over their sibling. One thing that most people do while driving is listen to the radio. This Power Wheels has a radio that is pre-programmed with five different songs. There is also a CB radio system in the interior of the vehicle that actually utilizes a real microphone, so if your child needs to announce something to bystanders, they can do so. It also gives them a way to sing along to the music as they are cruising down the sidewalk. 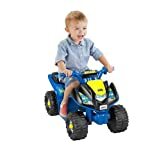 When it comes to the reviews of this Power Wheels, there are almost 700 found on Amazon alone, and 90 percent of all of them have given this toy a four or a five star rating. The reviewers seem to be happy that this is a durable product that lasts a long time; in fact, a few users even mentioned that the original battery was still going strong after five years of use. The Power Wheels Arctic Cat, which is our silver pick, is also an outdoor toddler vehicle that is manufactured by Fisher Price. The vehicle is designed after the Arctic Cat Prowler UTV. It is designed with a black frame, a jungle green body, and orange accents. If you are purchasing this Power Wheels for a girl, there is also a pink and purple option, which they will most likely prefer. This vehicle comes complete with a 12 volt battery, which means that your child will have a vehicle that is strong and durable. It also comes with a charger that makes it easy to replenish the battery when it becomes low. The Arctic Cat is able to run at two different speeds. The fastest is five miles per hour, and the lower speed is 2.5, which is great for younger children who may not be as experienced driving a Power Wheels. There is also a reverse that can be used to help a youngster get out of a sticky situation. If you do not feel that your child is ready for the higher speed setting, then you can lock out that speed option until they are more prepared. The vehicle is fitted with large tires that are designed to perfectly maneuver across flat surfaces as well as rugged terrain. This Power Wheels will have no issue going across a grassy yard. In addition, there are other features that are included on this Power Wheels that are designed to be like a full sized version of this vehicle; starting with the mounted head rests, the roll bar, and the front grille of the vehicle. It also comes with working tail lights and a fully functional truck bed and shovel. This means that your child can haul anything across the yard, which can range from their toys to leaves that they are helping you to rake up. The Arctic Cat is designed to be a two seat vehicle that keeps safety as a top priority. Both of the seats have a seatbelt to protect your little ones, and there is also a power lock braking system to make sure that when they take their foot off of the gas pedal, the vehicle will stop immediately. If you decide to purchase this Power Wheels, it comes with a one year warranty that covers all of the hardware from bumper to bumper. The battery is not covered by this warranty, but it is covered by a limited six month warranty. Our Bronze pick is also manufactured by Fisher Price, which proves that their products are durable, strong toys that your kids will love playing with. 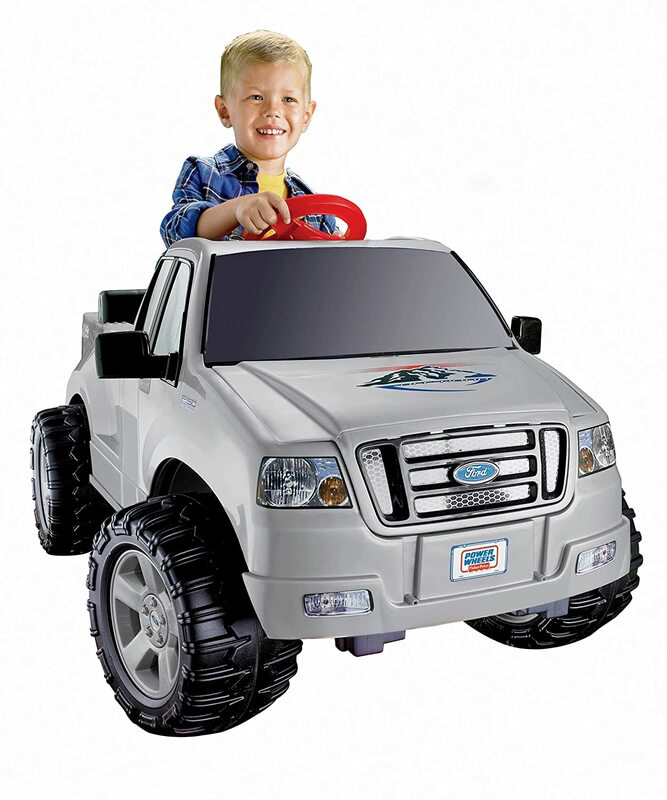 This is a single seat Power Wheels Ford F150, which means that it is a rugged truck that any truck enthusiast would love to give to their child. The grille, the lights, and the mirrors all look realistic; in fact, the mirrors can even be adjusted if your child wants to pretend that they are driving a real car. There is also a 12 volt, dual seat variation if you have two kids that would like to take a ride in the Ford F150. The truck also has beautiful stainless steel rims that look amazing. The tires are extra wide, which is great for off road adventures. Insofar as power, this truck only has a six volt battery, which means that it will only be able to function at a speed of 3.5 miles per hour. That is the slowest speed on our list so far, but that is a more than acceptable speed for most youngsters. This vehicle also has a very roomy truck bed that can be used to haul anything hat your kid needs; in addition, the hood opens as well. Inside you will notice a motor, which allows your child to pretend that they are working on the engine and keeping the truck in a good condition. Insofar as safety is concerned, the Power Wheels is comes complete with seat belts and an electronic breaking system that will stop on a dime when your child lifts their foot from the pedal. In addition, the truck is equipped with a stereo that plays real music; in fact, it can be connected to an MP3 player to stream music that your kids will enjoy. The vehicle comes with a one year warranty that covers all of the hardware on this device as well as a six month warranty for the battery. In addition, the six volt Ford F150 can be purchased in red, silver, or yellow on Amazon. Not every parent with a toddler has the money to go out and purchase a top of the line Power Wheels. You want your kids to enjoy the outdoors on a vehicle that is battery powered, but you do not want to sacrifice safety and durability to get such a device. Fisher Price has created an ATV style Power Wheels that does just that. Not only is it a stylish device that your kids will want to ride all day long, it is an option that is manufactured by a company that you trust at a low price point. This Power Wheels is designed to resemble a four wheeler. It is themed after one of Gotham’s favorite superheroes, so it is the perfect Batmobile for any young boy to enjoy. If you have a girl or a boy that would prefer another theme, there are plenty of other options available. You will be able to find a theme for any child to enjoy. This Batmobile is powered with a six volt battery, which means that it is not capable of traveling at fast speeds, but it is perfect for the age group that it was designed for, which is for toddlers between the ages of one and three. The manufacturer has also suggested that a child who is riding this device should not weigh over 40 pounds. The Power Wheels travels at speeds of two miles per hour. There is no reverse, so you do not have to worry about a youngster being unable to control this feature. It is simply powered on by the press of a button, which can be found on the handlebars. Since this vehicle is designed to go at low speeds, it may not have the power to travel through high grass or puddles of mud. It will maneuver best on pavement, such as driveways or sidewalks. The vehicle does not have a huge range of motion, so when your child is turning, you will notice that it makes wide turns. There is an area for a youngster to place their feet that is safely away from the wheels. There is also a secret compartment that is where the hood of this vehicle would be. This allows a young child the ability to pack away their favorite toy or blanket while they are driving their Power Wheels around on the driveway. Most Power Wheels are designed as miniature replicas of later adult vehicles. You can purchase the best Power Wheels that is designed to be an off road Jeep or a Hummer. You can find trucks, sports cars, and luxury vehicles as well. The style and design you choose for your child will most likely depend on their personality and the type of driving they will most likely take part in. Decide whether a off road truck is best for your child or a stylish Ford Mustang for them to cruise around on the beach. Let your child help decide which model they like best. Power Wheels are designed for both boys and girls, so it makes perfect sense that there would be themes that cater to each. What is your child’s favorite television show? Chances are that you will be able to find the best Power Wheels that is decorated with decals and designed in the style of their favorite show. 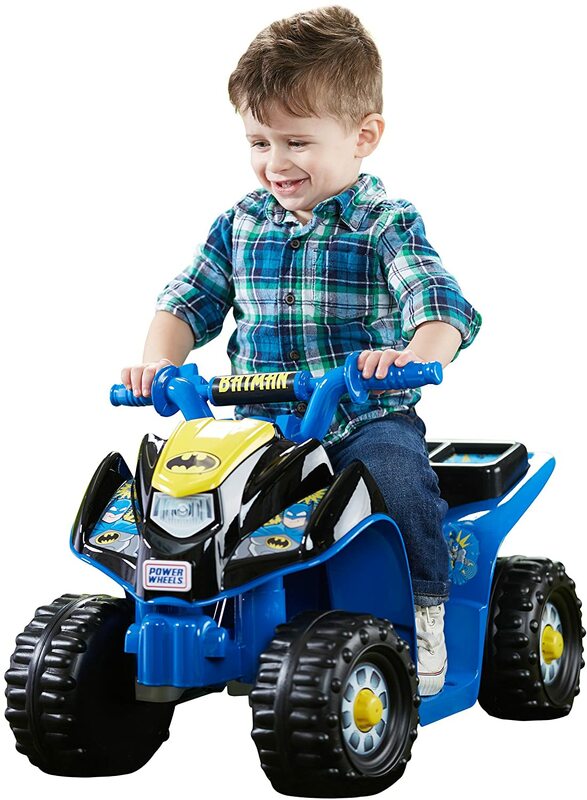 You can find Batman, Toy Story, Teenage Mutant Ninja Turtles themed Power Wheels for boys to enjoy. Girls will be happy to ride in a Barbie, Frozen, or Disney Princess themed vehicle. Smaller children might be interested in a Paw Patrol Power Wheels or one that features Thomas the Tank Engine. As with all toys that you purchase for a child, safety is a consideration you should make. Make sure that there are seatbelts inside the Power Wheels to keep them safe in the event of an accident. It is also a great tool to encourage and promote seatbelt safety in a real vehicle. In addition, make sure that the braking system of your child’s new Power Wheels is a power lock braking system that will be able to bring them to a full stop much quicker than vehicles without this system. Also, make sure that the brakes are always functional, even though your child is only traveling at five miles per hour, crashing head first into a tree because of a malfunctioning brake can cause them to be injured. Power and speed go hand in hand when it comes to Power Wheels. You can decide to purchase a vehicle that has a six volt battery, which will allow your child to travel at 2.5 miles per hour. A battery of this size will last for about an hour before it will need to be recharged. The second option is to purchase the best Power Wheels that has a larger 12 volt battery. This size of battery will allow your kid to double their speed to five miles per hour. In addition, the battery will remain charged for at least three hours of playtime before it will need to be recharged. The smaller batter is great for younger children, but as they get older, they may be less impressed with the power of the vehicle. If you think that your child will be happy driving their new Power Wheels on the pavement and nothing else, then you better think again. Most kids will want to go off road; they will want to drive in their yard, in the park, and most likely through mud puddles after it rains. To accommodate the adventures that your kid will want to go on, you will need to purchase a Power Wheels that is capable of traveling across grass and gravel. Make sure the tires have enough tread and traction to maneuver through your backyard. The last thing you need to be doing is pushing your child’s vehicle out of the mud. Having a warranty on a Power Wheels is just like having a warranty on a real car. The motor or the battery could go bad, so it is important to make sure that you will have coverage to replace those parts if they do go. Replacing Power Wheels parts can be costly, so having a warranty will be a great way to save money in the long run. Power Wheels are basically miniature vehicles that are designed for kids to enjoy. They can take a dirt path to the pool in their rugged off road Jeep, or they can cruise the sidewalks to impress their friends in their Cadillac Escalade. There are so many different styles of Power Wheels to choose from, that it may be a difficult decision to make, especially when other kids in the neighborhood have set the bar for which Power Wheels will rule the sidewalks. Take a look at our pre-purchase considerations, sit down with your youngster and look over our top picks, and then decide which option is best for your child. Your child will thank you for allowing them to help decide on their first set of wheels; Power Wheels that is.